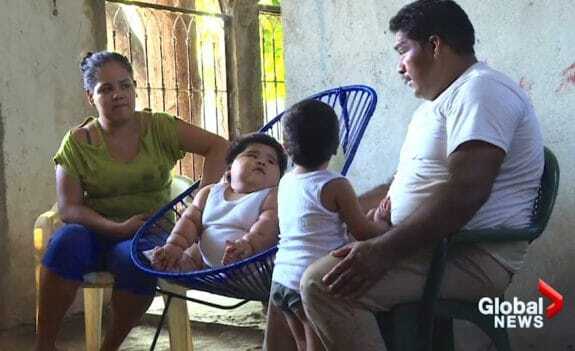 At birth, Luis Manuel Gonzales weighed a little less than eight pounds – nothing out of the normal. But now, at just 10-months-old, he dwarves his three-year-old brother, Mario. 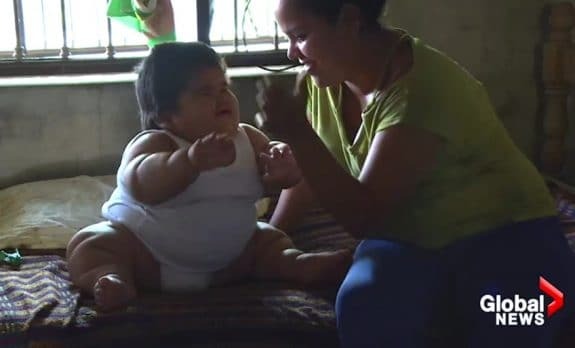 Luis’s mother, 24-year-old Isabel Pantoja, originally thought that the boy’s weight gain was due to her breastmilk. He’d shot up to over 22 pounds by the time he hit two months of age. 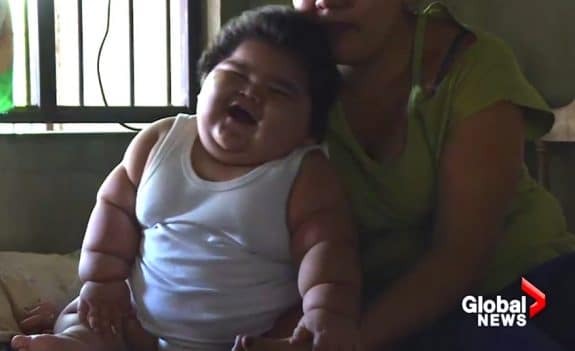 But when he gained almost 40 pounds over the next eight months, his parents knew something had to be wrong. 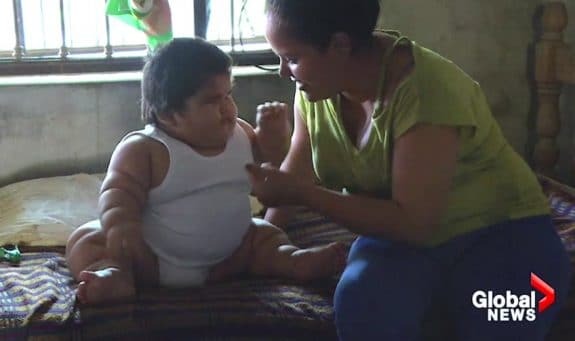 His parents, Isabel and Mario Gonzales, push him to the hospital almost daily in a decrepit stroller – it’s already caved under his weight once. Yet doctors still aren’t sure what’s wrong with him. 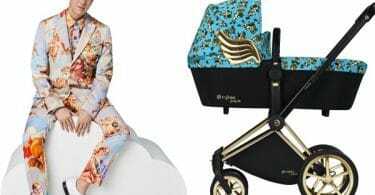 The current hypothesis is that it could be Prader-Willi Syndrome, a genetic condition that is characterized by weak muscle tone and an insatiable appetite. It can also cause developmental delays, genital issues, and heart problems. There is just one issue with this theory – the boy doesn’t eat excessively, nor does he spend his day demanding food. In fact, he’s a lot more like most infants his age than one would assume. He reaches for everything in sight, coos and plays with his feet, and can even sit up on his own. He can’t walk or crawl, but much of that may be due to his size. His mother is also getting exhausted, just trying to carry him around. Plus, everyone is worried that his condition – whatever it is – could be life-threatening. Silvia Orozco, a surgeon that specializes in nutrition, did recently reach out to the family and examine Luis. She believes she may very well know what’s wrong with the boy – she thinks poor maternal nutrition during pregnancy may have caused a glandular issue – but she is awaiting tissue sample analyses from the United States before giving a definitive diagnosis. However, if she is correct, the boy’s prognosis would be good. He would just need hormone shots. The parents have started a Facebook page and opened a bank account to accept donations for the boy’s treatments. The father does work but currently only receives $200 per month. The injections that Luis would need are expected to cost over $500 each.